After daily driving my AW11 for over a year, I decided I needed more creature comforts. Aside from randomly deciding not to start at times, the biggest issue was the lack of AC… in Texas. 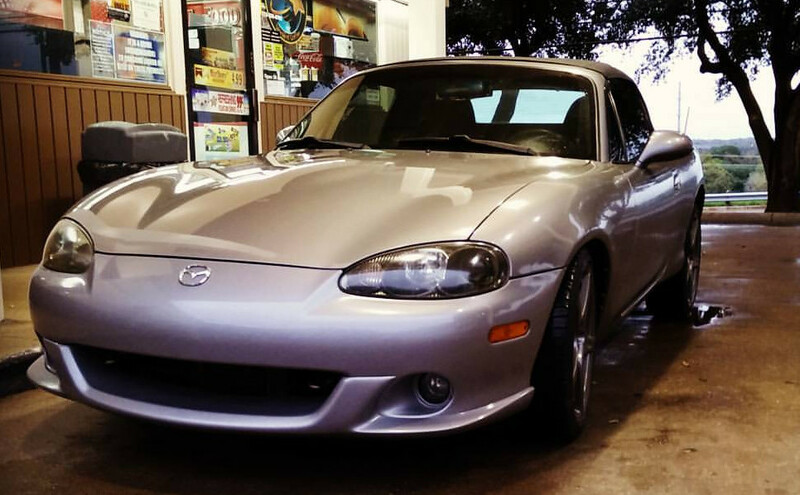 The Miata has been my favorite car for as long as I can recall. I have always felt it was the purest expression of a sports car. Small, agile, and with no frills. I don’t quite know why I’ve never manged to snag one, but I’m glad I finally did. This one is a 2004 Mazdaspeed edition, #1164/4000. As most of you know, it was equipped with a factory turbocharger and made 178bhp. Additionally it has a stiffer suspension and Bilstein shocks along with a torsen diff and some great looking Racing Hart wheels. This example has only 59,000 miles/95,000 km, which is quite low for being 11 years old. After almost 2 weeks of ownership, I can say I’m quite smitten with it. I have no immediate upgrade plans. The car feels perfect to me right now, but I also know that I lack the ability to leave any vehicle stock, so I’m sure some mods will find their way into the engine bay at some point. For right now, I’m just learning the car and enjoying it.